(CNN) - A newly revealed, centuries-old papyrus fragment suggests that some early Christians might have believed Jesus was married. The fragment, written in Coptic, a language used by Egyptian Christians, says in part, "Jesus said to them, 'My wife ..."
Harvard Divinity School Professor Karen King announced the findings of the 1 1/2- by 3-inch honey-colored fragment on Tuesday in Rome at the International Association for Coptic Studies. King has been quick to add this discovered text "does not, however, provide evidence that the historical Jesus was married," she wrote in a draft of her analysis of the fragment set to appear in the January edition of Harvard Theological Review. The divinity school has posted a draft of King's article to which AnneMarie Luijendijk, an associate professor of religion at Princeton University, contributed. "This fragment, this new piece of papyrus evidence, does not prove that (Jesus) was married, nor does it prove that he was not married. The earliest reliable historical tradition is completely silent on that. So we're in the same position we were before it was found. We don't know if he was married or not," King said in a conference call with reporters. "What I'm really quick to say is to cut off people who would say this is proof that Jesus was married because historically speaking, it's much too late to constitute historical evidence," she continued. "I'm not saying he was, I'm not saying he wasn't. I'm saying this doesn't help us with that question," she continued. In the accounts of Jesus' life in the Bible, there is no mention of his marital status, while the accounts do mention Jesus' mother, father and siblings. The four Gospels - Matthew, Mark, Luke and John - tell the story of Jesus' birth and early childhood then skip to his short, three-year ministry before detailing his death and resurrection. The idea that Jesus was married is not a new one. In other writings about the life of Jesus from antiquity suggest Jesus may have been married to Mary Magdalene, a disciple who was close to Jesus. Author Dan Brown also used the idea of Jesus being married as a jumping off point for the fictional novel "The Da Vinci Code." King dismissed that notion in her call with reporters. Initial dating for the honey-colored fragment by the team of scholars puts the papyrus piece coming out of the middle of the second century. 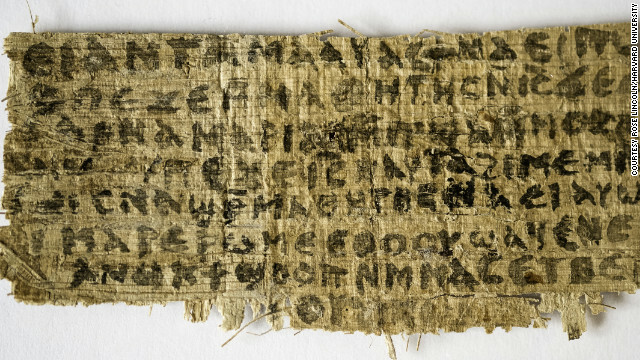 King is referring to the fragment as the "The Gospel of Jesus' Wife" or "GosJesWife" as a short hand for reference, and noting that the abbreviation does not mean this scrap has the same historical weight as the canonical Gospels. Biblical scholars often use the term gospel to refer to a genre of ancient writings featuring dialogue between Jesus and his disciples, King notes in her paper. The Gospel of Thomas, the Gospel of Mary and the Gospel of Judas are just a few of the ancient accounts about the life of Jesus that Christians do not consider canonical. Bock agreed with the notion that the text fragment shared similarities with those gospels, called the Gnostic Gospels, which were the writings of an early outlier sect of Christians. He said the text could be referring to a "gnostic rite of marriage that is a picture of the church and Jesus, not a real wife." The owner of the fragment has been identified by King as a private collector who has asked to stay anonymous. The owner brought the fragment to Harvard have King examine it in December 2011. King then brought it to the Institute for the Study of the Ancient World at New York University. Roger Bagnall, the institute's director and an expert on papyrus, examined it and determined it to be authentic, Bangall confirmed to CNN. Little is known about the origin of the text. Because both sides of the fragment have writing on them, King said it could have come out of a book rather than a scroll. "Just like most of the earliest papyri of the New Testament and other literary and documentary papyri, a fragment this damaged could have come from an ancient garbage heap," the King says building on prior research by Luijendijk. King writes "the importance of the 'Gospel of Jesus’ Wife' lies in supplying a new voice within the diverse chorus of early Christian traditions about Jesus that documents that some Christians depicted Jesus as married." The Smithsonian Channel also announced Monday that it will air a special on King's findings on September 30.
gucci outlet online cheap nba jerseys from china discount jerseys custom women nfl jerseys Angus Leonard writes articles about insurance and for more information about the services offered, click these , & . ..(Sir) Edward Gibbon (The Decline and Fall of the Roman Empire 1777), who was the foremost scholar of classics, Latin and Homeric Greek, stated that there was no evidence of the existance of this Jesus Christ! He was also and apostate Catholic! He was one of the most prolific writers of all time, who blamed (in a big part) of the fall of ancient Rome to this mythical Jesus, who never existed! Whether or not this fragment is a "fake" depends on how you define fake. The experts who have examined it do believe that it is not a modern product confected to appear ancient, counterfeit or forger, but is legitimately from somewhere around 400AD. But that means it was written over 350 years after Jesus died. 350 years is about 12 generations after Jesus death. Could a quotation from Jesus survive orally accurately for 12 generations, 350+ years? Much the same may very well be asked of the many famous quotations of Jesus that do survive. How about that, "I'm am the good shepherd," line? Could If we believe that that quotation survived accurately, then why not this one? And if we cast doubts on this wife quotation, then do we not equally call into question the shepherd quotation too? There is, however, a very key difference between the two. The shepherd quotation is contained in many very complete texts that we have that span many generations. This wife quotation so far has been found only on this one fragment. Imagine an archeologist thousands of years from now who finds a fragment from one of the Harry Potter books. Not knowing what it is, pure fiction, that person could reach some very wrong conclusions. www dot hds dot harvard dot edu/faculty-research/research-projects/the-gospel-of-jesuss-wife is a very scholarly look at this fragment and yet written at a very approachable level. Among other things, it includes a full translation of the text on it. Not one line of it is clearly a stand-alone sentence. One line reads, "let the wicked people swell up" which could be stand-alone sentence, but even that sort of yearns for more. Another reads, "she will be able to be my disciple" which could also be a stand-alone sentence but lacks any pronoun reference; we would like to look to the context to that pronoun reference, but, because this is a middle-of-the-page fragment, we don't have reliable context. This fragment is torn out of the middle of a page (which is pretty obvious when you look at it). The first line reads, "not [to] me. My mother gave me my li[fe]." Those square brackets mean that the stuff inside of them is not a direct translation but is assumed. Many have assumed that Jesus is the supposed speaker of those words. But the text itself doesn't claim that. Jesus isn't named until the fourth line on the fragment. Maybe this line quotes a different speaker? We don't know. There's a lot we don't know. What we have are bits and fragments of sentences that are completely out-of-context. The Greek of the day was very weak on punctuation. This makes reading such a fragment even more perilous. Since this fragment was discovered, scholars have been struggling to figure out what it is a fragment of. Do we have a more complete copy of this text? It's not unusual for archeologists to find bits and fragments. We do this in our own lives, we find them in our brains. We say, didn't someone famous say something about "death and taxes" What was that? Who said it? Well, punch that fragment into google and you'll soon have the full quote, "In this world nothing can be said to be certain, except death and taxes." and the author, Ben Franklin. Do that with any fragment from any of the canonical biblical books and you will see that we have, over the many years, found many other fragments and entire pages and nearly intact books that contain that exact fragment. It fits. But, so far, we have found no context into which this new fragment fits. It's a "stand alone," a "one-up." And, as such, we have to be very careful not to read too much into it. The Harvard scholars who have studied it have taken the very approach I suggest. They report on the fragment factually and avoid making any assumptions about what greater meaning it might have. The papyrus fragment is probably not fake. But what is a fake is the presumptions that are being make in the popular media about what it says and means. The theme is a recurrent one. In the gospels found at Nag Hamaddi, many of the Coptic texts either had him married, or in an intimate relationship with Mary of Magdala. So it "fits", historically. Jesus does have a wife. It is the Church. It is spelled out clearly in the bible. The divine feminine is a recurring theme. Yahweh had a wife, for most of the time Israel worshiped him, 1000 – 1 BCE. Her name was Ashera. This statement is for GABRIEL MALAKH, I would like to know where you heard that CNN made the comment that the text was fake? I googled the story myself an read all the articles an watched the video an there was not one mention of this being a fake! Matter of fact it WAS proven to be AUTHENTIC an the SMITHSONIAN CHANNEL will be doing a story on it on September 30th! Maybe you need to do better research on the subject before you start making false claims yourself!!!! This is exactly i'm in srceah of. Here is what I refer to quality. The data provided in this article is to the most successful. I have to say you will require bought some time in showing every one of these content jointly. They're relevant to your market. I am going to advocate these to any or all and then to all of my associates. I'll come back here to check out the quality of function. Thank you for generating this specific ensue. I should write a bunch of stuff about Jesus...then maybe in 1000 years someone will believe it. Call it trolling level: God-Like. Better yet, write about Umbi Gumbi. Oooops. I just googled Umbi Gumbi and found it actually has a referent. No harm intended. OK to summarize to date. Jesus evidently had a wife, and he didn't like to talk about her much. Evidently, she was very reptilian – sort of a Michele Bachmann type. But he kept her around for social appearances, but I'm sure she was quite the nag. He loved the famous "one that Jesus loved" who was either another man or possibly a hermaphrodite – hard to say, but Leo kind of capture the image well. He liked people's feet – we do know that. I think that brings us up to date in case someone new is coming to this. Your first statement is correct. He didn't talk much about his children either, although there is circu.mstantial evidence that he loved them dearly. Why did you continue with the disparaging remarks? Throughout the bible old and new testament the church is referred to as the bride of Christ... Dosn't it seem abvious that that is what this text was referring to? Or am I missing something here? Cnn has confirmed that it was a scam! As always, the children of the Devil are always looking for ways to discredit God's word, but always falls flat on their face just like scientists who tries to prove that there is no God, ends up proving the existence of God in their research. There is no scientific research that has proved any such thing. Gabriel: How does one prove a negative? Does your inability to prove there are no leprechauns mean there are leprechauns? Along those lines, there are other scriptures that lead us to believe what Christ is referring to is his church. Jesus never said "he said" or "she said" unless he was speaking metaphorically. Christ would not teach from the words of anything other than the Word of God. All things equal, the simplest solution is that he was again, as he did his entire ministry, speaking in a parable. Here's an example: Mark 3 31:35 Then Jesus' mother and brothers came. They stood outside and sent a person in to tell Jesus to come out. Many people were sitting around Jesus. They said to him, "Your mother and brothers are waiting for you outside." Jesus asked, "Who is my mother? Who are my brothers?" Then Jesus looked at those people sitting around him. He said, "These people are my mother and my brothers! My true brother and sister and mother are those people that do the things God wants." Does Scripture say that you must believe that The Messiah had a wife in order to be saved?! Absolutely not. One thing it does say, " DO NOT BE DECEIVED! " It matters not whether Christ married on Earth. Since the time of His resurrection falsehood has been spread. For it is written that false teachers, prophets, and doctrines would be. My spirit grieves for this fallen generation. For it is written, many will be deceived. And there will be a great falling away. The love of many will grow cold. Even the elect. Nevertheless, it must come to pass. I will pray, and watch. Lord, have mercy. For they know not what they do. It is apparent that the " father of all lies " continues to deceive the masses. Nevertheless... "The Word of the Cross is foolishness to those who are perishing, but to those who are being saved it is the Power of God!" Ok, ok , this could be a lie, but what if jesus was married? i would be happy if he had a wife and kids, and lived a happy life, what its wrong with that? there is no sin in being married, having kids, it doesnt make jesus less holy. From Egypt has been found several Gnostic texts. New Testaments distorted, and corrupted texts have been made in Alexzandrian Egypt. Egypt has been in a big role distorting the genuine texts of the New Testament. Ancient Egyptian Coptic gospel of Jesus' wife can be genuine or forged Coptic – Gnostic text, but in every case, it is the false text as the purpose to distort genuine Biblical gospels. On Coptic language have been made several Gnostic false gospels as the purpose to distort genuine Biblical gospels. Coptic language gospel of Jesus' wife is false text distorting the real gospel. Gospel of Jesus' wife is written much later as original New Testament texts. Text of gospel of Jesus' wife contains non-biblical teaching against the Bible. Before mentioned things both together prove that gospel of Jesus' wife is not the genuine text of the Bible, but faked Gnostic false gospel. The disciples of Early Church didn't believe that Jesus was married. Contemporaries of Jesus knew it, and the Bible doesn't record that Jesus married to Mary Magdalene. Claims that Jesus married with Mary are based on lies, and it doesn't come true when some people believed this Gnostic lie about the marriage of Jesus. You're right, there is nothing wrong with getting married and having children, but that was not his purpose for leaving his Heavenly abode, where he enjoyed being with his Heavenly Father. He came to sanctify Jehovah's name, preach about His Kingdom, save mind kind from sin and death, and leave an example for mankind to follow his steps closely. Marriage was not part of God's purpose for him, because he was to be resurrected and return to Heaven to establish the Messianic Kingdom. “‘Our Father in the heavens, let your name+ be sanctified. *+ 10 Let your kingdom+ come. Let your will+ take place, as in heaven, also upon earth. 21 In fact, to this [course] YOU were called, because even Christ suffered for YOU,+ leaving YOU a model* for YOU to follow his steps closely. 14 And this good news+ of the kingdom+ will be preached* in all the inhabited earth* for a witness* to all the nations;+ and then the end*+ will come. "The Word of the Cross is foolishness to those who are perishing, but to those who are being saved it is the Power of God!" If that is the case the word of the cross is pretty useless. It is only able to affect those who already believe it.